HarbisonWalker International (HWI) announced it is investing USD 30 million to construct a new, state-of-the-art monolithic refractories manufacturing facility. The new facility will be located along the Ohio River Valley in the Northern Kentucky/Southern Ohio region of USA. Lucideon, the international materials technology company, has designed a new training module, QC During Refractory Installation specifically for the refractories, refineries, petrochemical and power generation industries. The International Aluminium Institute (IAI), the global association of aluminium producers, launched a new web-based tool to visualise the aluminium value chain, from bauxite to scrap, including inter-regional trade flows. H.C. Starck, one of the world’s leading manufacturers of technology metals and advanced ceramics, has once again received certification for processing of “conflict-free” tantalum raw materials – the 6th year in a row the company has done so. Unlike in past years, the adjustment of the structures under corporate law meant that this year’s audit included the newly founded subsidiary H.C. Starck Tantalum and Niobium GmbH and the associated company H.C. Starck Smelting GmbH & Co. KG. AGC Asahi Glass/JP establishes a new production base for TFT-LCD glass substrates in Shenzhen/CN. 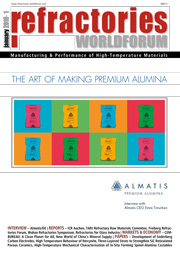 The report analyzes the worldwide markets for feldspar by the following end-use segments: glass, ceramics, fillers, and others. The report provides separate comprehensive analytics for USA, Japan, Europe, China, Asia-Pacific, and rest of world. Alcoa Corporation/US intends to permanently close the Suralco alumina refinery and bauxite mines in Suriname, fully curtailed since November 2015. The global market for Refractories is projected to reach 42,5 Mt by 2022, driven by the projected recovery of iron, steel and cement industries in view of the slated growth in infrastructure development in emerging markets. Koch Industries Aquired Guardian Industries Corp.
Koch Industries/US has completed the acquisition of Guardian Industries following the receipt of all regulatory approvals. Koch initially invested in Guardian in 2012, acquiring a 44,5 % minority interest in the company at the time. Tenova Inc./US has been contracted by NLMK Group/US to design and supply a 395 t/h walking beam furnace for reheating slabs at its Sharon, Pennsylvania plant. The size of the furnace will make it one of the largest walking beam furnaces in North America upon completion. Fives/BE, successfully started a new complete float glass line with a melting capacity of 800t/d to produce a glass thickness of 3 –10 mm for the Turkish glassmaker Düzce Cam. The start-up took place as planned on November 2016 at the Düzce site, some 220 km from Istanbul. The MRS Research Group/US Refractory Ceramic Fibres (RCF) report represents an inclusive evaluation of the RCF market and comprises considerable insights, historical data, facts, and statistical and industry-validated data of the global market. The MRS Research Group report highlights informative data and in-depth analysis of RCF market and its corresponding segments that are based on technology, geography, and applications. 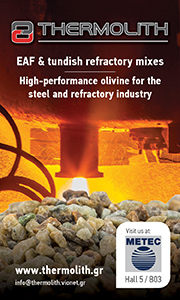 Imerys/FR has closed the acquisition of Damolin, a Danish mineral-based solutions producer. This transaction will enable Imerys to enlarge its specialty offer to the European oil and chemical absorbent market, as well as to animal feed and cat litter businesses. The report provides a basic overview of the flake graphite market including definitions, classifications, applications and chain structure. The flake graphite industry analysis is provided for the international market including development history, competitive landscape analysis, and major regions development status. The NSG Group/JP has decided to restart a suspended architectural glass float line at the site of ist wholly-owned subsidiary in Venice/IT (Venice Line) in the 3rd quarter of 2018. With process modifications associated with the restart, the Venice Line will become capable of producing VA (value-added) products. The NETZSCH Business Unit Grinding & Dispersing, with headquarters in Selb/DE, acquired the company Ecutec Barcelona SL/ES effective 17 November 2016.